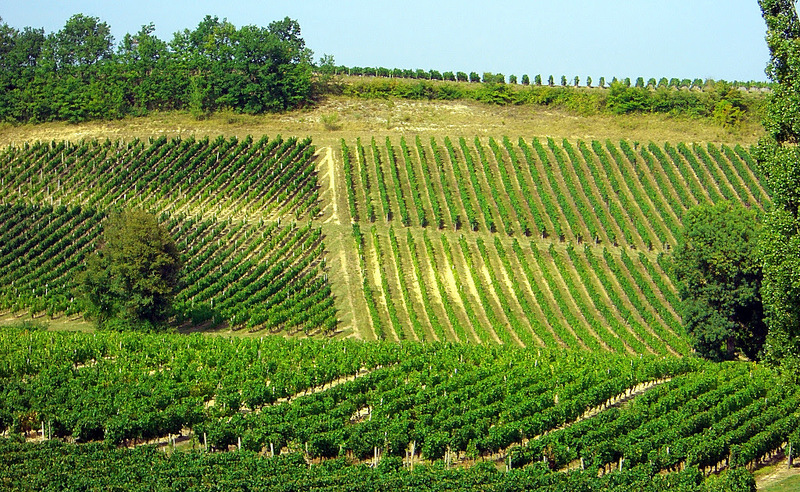 The appellation of Fronsac is one of Bordeaux’s lesser known winemaking regions. It is an area of back-country roads and tiny vineyards a stone’s throw from the celebrated appellations of Pomerol and Saint-Émilion. Indeed, Fronsac is five times smaller than Saint-Émilion, with a more homogenous terroir of limestone and clay — “Fronsac molasses” it’s sometimes called by the grape farmers that toil its vineyards. By any name the Merlot grape is natural in these soils. In the right hands, wines made in Fronsac can be as good as many of the wines from its big-name neighbors, without the big-name price tag. While the vineyards of Château La Vieille Cure were cultivated as far back as the 17th Century, the modern era for the estate begins in the mid-1980s as the property saw a complete renovation, from vineyard to cellar. It took less than a decade after the rebuilding effort for the estate to be recognized among the top producers in the Fronsac appellation. With 50 acres in one single plot, Château La Vieille Cure appears on a famous map of the Guyenne region, known as the Belleyme map, dated 1780. These vineyards, planted to 74% Merlot, 22% Cabernet Franc and 4% Cabernet Sauvignon, lie on ideally positioned southeast facing slopes of a plateau at about 200 feet in elevation between the towns of Saillans and Fronsac overlooking the river Isle and the Dordogne. The estate boasts some of the oldest vines in the region. Winemaking at Château La Vieille Cure is overseen by Jean-Luc Thunevin, recognized as a leading figure on the “Right Bank” of Bordeaux from his formation of the Saint-Émilion Premier Grand Cru Classé Château Valandraud. At harvest, all fruit is hand-picked and hand-sorted. Fermentation takes place in stainless steel vats while aging takes place in French oak barrels, a portion of which are new. The 2015 vintage of Château La Vieille Cure presents itself first with exuberant aromatics of black raspberry, mocha, and cedar plank grilled herbs. On the palate the warm 2015 vintage registers as generous fruit yet the ripeness never becomes tiresome due to an ideal freshness coupled with a vein of minerality that persists through a lengthy finish. At this price you won’t feel bad opening a bottle to pair with burgers or buying a bunch to drink over the course of the next decade.